One of the new series for 2014 is the Sportsman, which should be out any week now. You may have seen the promotional photo over at IPPC; if not, I’ve reposted it here. I don’t know how many of the shapes are actually in production yet, but the 01 Sportsman in my hands is one of the first out the door. In the promo picture, from left to right, it looks like shapes 105, 01, 68, 69, 87 and 02. Three finishes on display: Kelly green smooth, matt walnut, and orange/brown contrast for the blast. 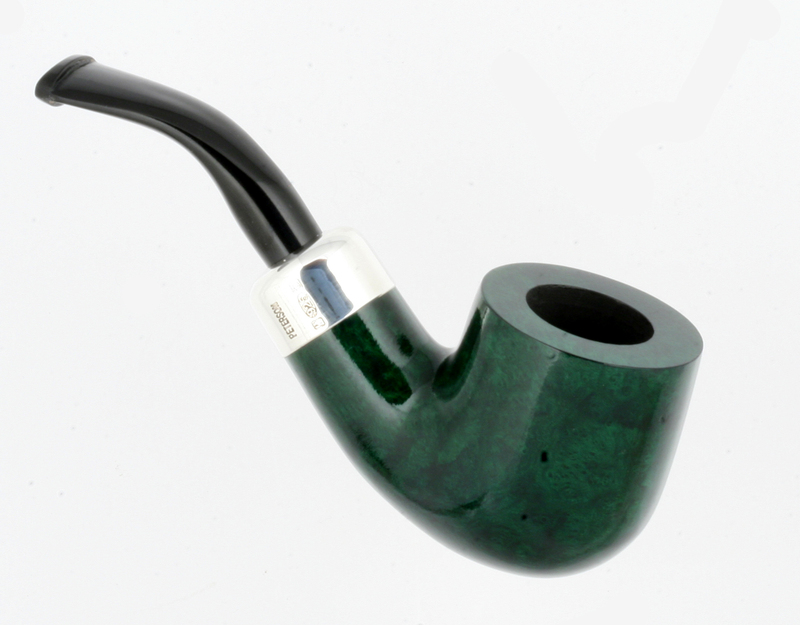 K&P has shown an interest in pocket pipes almost since their founding. The 1905 catalog features a number of them, including outdoor pipes like the R.I.C. (which stands for Royal Irish Constabulary, the name of the official Irish police force back in the day), and indoor “opera” pipes like the Oval and the Pat. The oval-bowled pipes were meant to fit neatly inside one’s tail coat for smoking entr’act. Since then there’s been the SPORTS line, introduced in 1947 but not well known in the States until the early 1970s. These pipes used full-size Classic Lines bowls but cut down the shanks to accommodate small P-Lips (except on the original 5 Bulldog, which just used a stubby full-sized stem. There was a renewed interest in the Sports line in the first decade of this century, emanating from Italy, where they’ve been a constant seller over the years, and some of them have made their way onto the U.S. market. 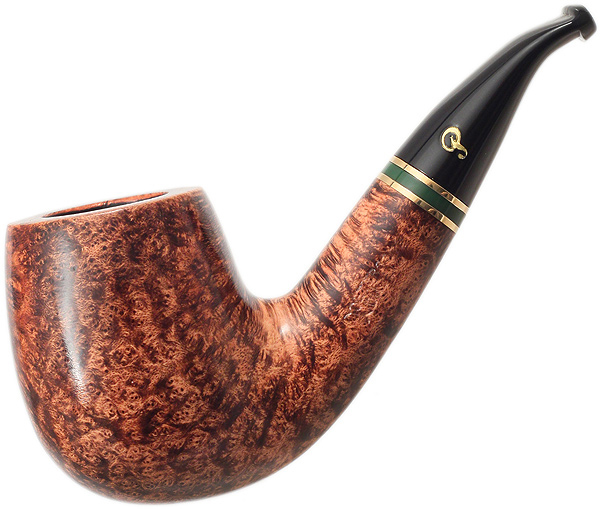 In about 2011 a new outdoor pocket pipe series emerged, the Outdoor, again featuring full-size bowls with shortened bowls, this time with what appear to be small fishtail stems. There were some great shapes, and I kept meaning to buy one, but didn’t, and now they’re gone. Fast forward to 2013 when the Hunter (shape 106) and the Golfer (shape 69) were released in Italy, the former in a brown and orange contrast blast and the latter in a gloss smooth green finish, both with sterling mounts and shortened fishtail ebonite stems. My guess is that these sold well enough to convince Peterson to expand the concept with the introduction of the Sportsman line. Many pipemen shy away from “nosewarmers,” believing they smoke hot. This is a difficult myth to debunk, but I’ll do my best. Most of us believe the longer the pipe’s shank, the cooler the smoke will be when it enters the mouth. And yet in point of scientific fact, the coolest place is where the smoke enters the air hole. If you look at Robert F. Winan’s excellent chapter “Reflections on Tobacco,” pp. 58-62 in The Pipe Smoker’s Tobacco Book (1972)—which I think is still available from Briar Books Press—he’ll demonstrate that the average temperature of pipe-smoke ranges from 85° to 118° F with an average temperature of 96°, or slightly less than body temperature. As Winan says, “if coffee were served to you at this temperature you could gulp it down without hesitation and then complain about being served tepid coffee” (60). The real culprit of tongue-burn is the alkalinity of the smoke in your tobacco and your palate’s ability to deal with it. How much or less tongue-burn you get depends both on your palate and the smoothness of a pipe’s airflow. The easier and smoother the airflow, that is, the less turbulence of the smoke, longer your palate will tolerate the smoke’s alkalinity. That’s why the great Danish artisan pipe-makers are so insistent on good airflow, above the aesthetics of the wood and above the pipe’s shape. I can only give you a report on the appearance of the 01 Sportsman, as I haven’t smoked it yet, but I’ll follow-up in a few weeks with my impressions. The 01 Classic Line bowl dates back to 1978, when it was introduced with three other new System shapes that simultaneously entered the Classic Line. It’s a short version of one of the first shapes Charles Peterson released, the straight-sided billiards of 1896—a kind of sawed-off 309 / 4S. The Sportsman 01 is just a little lighter than the 301—coming it at 45 gr / 1.60 oz over the 301’s average weight of 57 gr / 2.0 oz. The chamber of this Sportsman 01, which has been treated with Peterson’s standard pre-carb coating, is about average for the 01 shapes, 20.35mm wide by 39.22 mm (that’s .80 in x 1.54 in), making its geometry just a little less than 1 : 2. For my tobacco tastes, that means using the pipe for English, oriental and Balkans, but your mileage will be different. Army mounts and the army tenon-mortise are always a problem to review, since most people don’t understand them or how they work. My 01’s tenon goes 11.7 mm / 46 in into the mortise, which is 29 mm / 1.14 in. deep. That leaves a not-inconsiderable gap of 17.3 mm / .68 in. But before you throw up your hands in horror at all that empty space, remember that all army push-mounts have a gap; that’s the way they’re built. And no, they don’t pass the “pipe-cleaner test”—they’re just not made to do that. What they’re made to do is never break or crack (hence the nickel or in this case sterling mount) and allow you to take out the stem at any time, whether the pipe is hot or cold. Does the mortise chamber act like a kind of mini “reverse calabash” for an army mount? 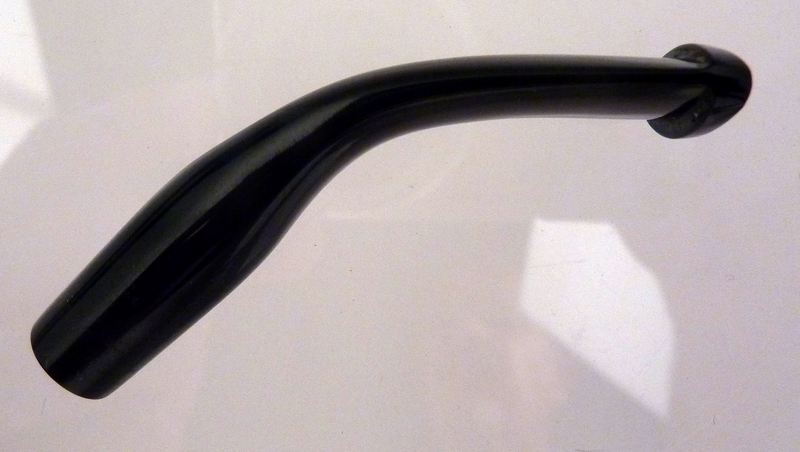 I don’t know, but my 1908 Antique Reproduction from Peterson is one of my five best smoking pipes, ever. The stem is well-made, with a good convex arc to the fishtail making it comfortable against the tongue and good upper and lower shelf at the button for clinching. It’s plenty wide (16.5mm / 0.65 in). The air-hole is slotted at the button, with a good V-shape, if smaller and less deep than that produced on the magnificent stems we see adorning the Aran and other Classic Lines. 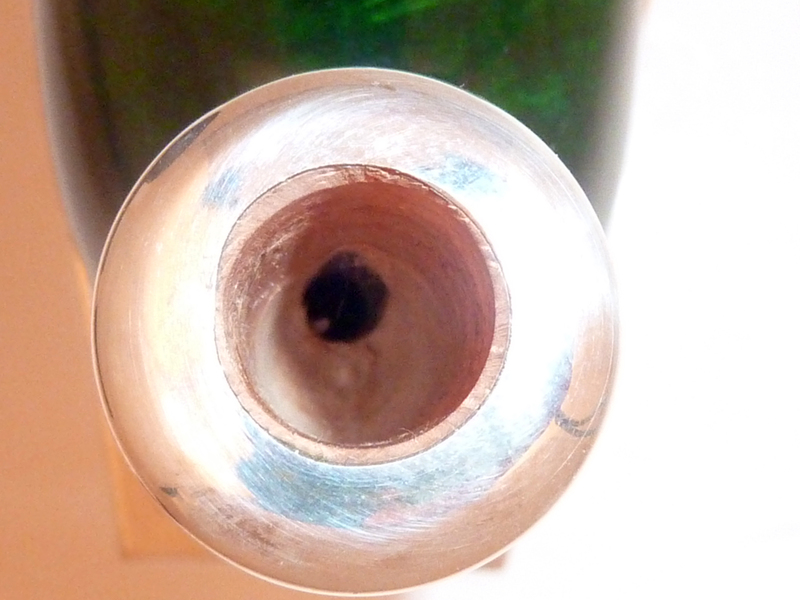 The air-hole opening at the tenon-end is about 2.5mm, with no chamfer as you can see. This causes me a little concern for the airflow, but we’ll see, right? It’s an easy problem to fix if you’re a DIYer. Thanks again, Mark. I’ve been smoking it for awhile now, as a first pipe of the day, with Balkans. I don’t know how or why it should smoke as well as it does with such a constricted airhole in the mouthpiece, but so far, it’s been great. I’m looking to buy a Peterson Sportsman 221. How has your Peterson Sportsman smoking now that you have had it for a while? Do you recommend someone purchasing one? 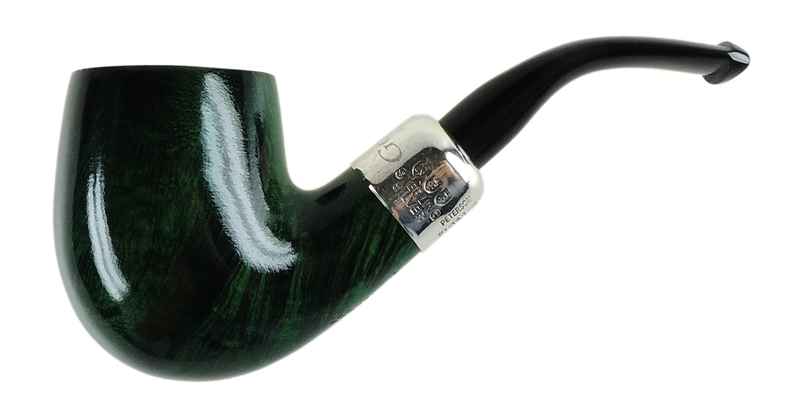 It is an unusual experience, smoking a pipe with such a short stem. But as an engineering friend in Germany explained to me, the temperature of the smoke will not be effected. That’s what I found. I also had doubts as to the engineering of the thing–it seemed like a small draft hole in the mouthpiece. Again, Zero complaints. I say “Go for it!” They’re quite unusual, and will always be a talking point in your collection. Thank you for getting back to me. I went ahead and ordered the pipe.